Dzmitry Tsetserukou received the Ph.D. degree in Information Science and Technology from the University of Tokyo, Japan, in 2007. From 2007 to 2009, he was a JSPS Post-Doctoral Fellow at the University of Tokyo. He worked as Assistant Professor at the Electronics-Inspired Interdisciplinary Research Institute, Toyohashi University of Technology from 2010 to 2014. Professor Tsetserukou is establishing and managing the Space Robotics Lab. and Wearable Media Lab. His research interests include sensors for robots, wearable haptic and tactile interfaces and displays, humanoid robots, telexistence, affective haptics, human-robotic interaction, virtual and augmented reality, artificial intelligence, natural language processing. 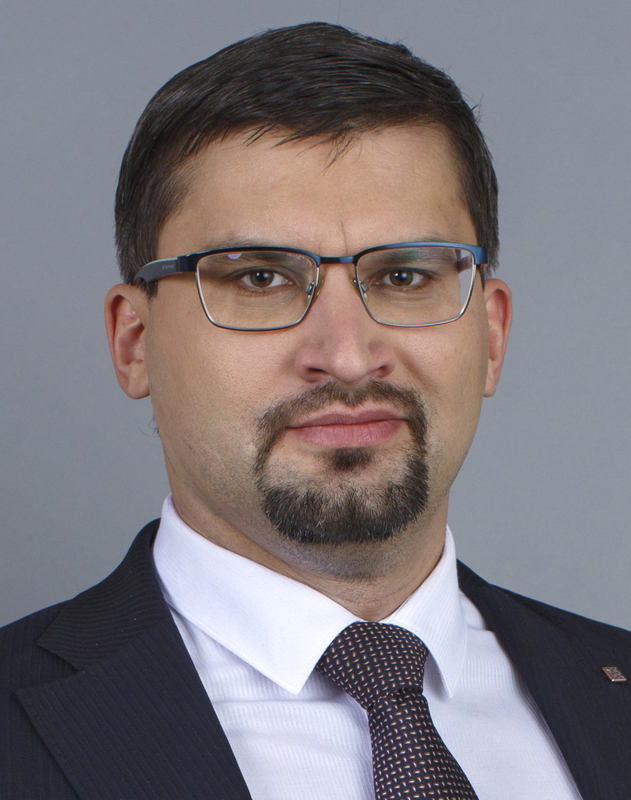 Dzmitry is a member of the Institute of Electrical and Electronics Engineers (IEEE) since 2006, Virtual Reality Society of Japan (VRSJ) and the author of over 70 technical publications, 3 patents, and a book. He received а Best Student Presentation Award as co-author at the Int. Conf. IRAGO 2013 and a Best Paper Award at the Int. Conf. Augmented Human 2010. He was an organizer of the first Workshop on Affective Haptics at IEEE Haptics Symposium 2012 and served as served as co-chair of the AH 2011. Google Scholar: H-index 13; citations 484. Scopus: H-index: 9; citations 277. (15.02.2019). Book:D. Tsetserukou, J.-G. Fontaine, O.V. Berestnev, A.M. Goman, Y.L. Soliterman. Designing of the spherical motion platform on the basis of four-bar linkage for virtual reality systems. Minsk: UP “Technoprint”, ISBN 985-464-588-6, 2004, 102 p.
Book сhapters: D. Tsetserukou and S. Tachi, “Torque Sensors for Robot Joint Control”, pp. 15-36. In J. G. Rocha and S. Lanceros-Mendes (Eds), Sensors, Focus on Tactile, Force and Stress Sensors. I-Tech Education and Publishing KG, Vienna, Austria, December 2008. D. Tsetserukou, N. Kawakami, and S. Tachi, “Design, control and evaluation of a whole-sensitive robot arm for physical human-robot Interaction,”International Journal of Humanoid Robotics,Vol. 6, No. 4, pp. 699-725,December 2009. D. Tsetserukou, N. Kawakami, and S. Tachi, “iSoRA: humanoid robot arm for intelligent haptic interaction with the environment,”Advanced Robotics, Special Issue on Intelligent Robotics and Automation, Vol.23, No.10, pp. 1327-1358, August 2009. D. Tsetserukou, H. Kajimoto, N. Kawakami, and S. Tachi, “Safe reaction of a robot arm with torque sensing ability on the external disturbance and impact: implementation of a new variable impedance control,”Journal of Automation, Mobile Robotics and Intelligent Systems, Vol. 2, No. 4, pp. 31-37, September 2008. D. Tsetserukou, R. Tadakuma, H. Kajimoto, and S. Tachi, “Optical torque sensors for local impedance control realization of an anthropomorphic robot arm,”Journal of Robotics and Mechatronics, Vol.18, No.2, pp.121-130, April 2006. Berestnev and D. Tsetserukou, “Disclosing approach of the statically indefinable system for the load distribution determination in pin gearing with account machining tolerances,”Proceedings of the National Academy of Sciences of Belarus, Vol. 3, pp. 35-38, May 2002. D. Tsetserukou, S. Hosokawa, and K. Terashima “LinkTouch: a Wearable Haptic Device with Five-Bar Linkage Mechanism for Presentation of Two-DOF Force Feedback at the Fingerpad,” Haptics Symposium 2014, Houston, TX, US, February 23-26, 2014, pp. 307-312. T. V. Thu, T. Takamura, D. Tsetserukou, and A. Sandhu, “Synthesis of Magnetic Thermoplastic-based nanocomposites,” inProc.Irago Int. Conference 2013 (Irago 2013), Tahara-City, Japan, Oct. 24-25, AIP Conference Proceedings (2014), 1585, pp. 141-144. D. Tsetserukou, S. Hosokawa, and K. Terashima,“Augmented Haptic Human-Robot Interaction through Wearable Haptic Display and Haptic Rendering,”inProc. Irago Int. Conference 2013(Irago2013), Tahara-City, Japan, Oct. 24-25, 2013, p. 79. D. Tsetserukou A. Neviarouskaya, and K. Terashima, “iFeel_IM! : a cyberspace system for communication of touch-mediated emotions,” inProc. Workshop on OTM 2013 Industry Case Studies Program, OnTheMove 2013 International Conference, Graz, Austria, September 9-13, 2013, pp. 70-77. H. Sugiura, D. Tsetserukou, and K. Terashima, “ExoPower: wearable robotic hand for hand function rehabilitation,” inProc.Asia-Pacific Interdisciplinary Research Conference 2012 (AP-IRC 2012), Tahara-City, Japan, Nov. 15-16, 2012, pp. 53. Y. Nakagawa, D. Tsetserukou, and K. Terashima, “Development of “ExoInterface II” exomuscle haptic device,” inProc.Asia-Pacific Interdisciplinary Research Conference 2012 (AP-IRC 2012), Tahara-City, Japan, Nov. 15-16, 2012, pp. 54. D. Tsetserukou, “Emotional telexistence communication system with affective gear capable of fEMG-based emotion detection and generation of affective haptic stimuli,” inProc.Asia-Pacific Interdisciplinary Research Conference 2012 (AP-IRC 2012), Tahara-City, Japan, Nov. 15-16, 2012, pp. 55. J. Sugiyama, D. Tsetserukou, and J. Miura, “NAVIgoid: robot navigation with haptic vision,” inProc.Int. Conf. on Computer Graphics and Interactive Technologies(ACM SIGGRAPH Asia 2011), Emerging Technologies, Article No. 9, Hong Kong, China, December 12-15, 2011 (acceptance rate 50 %). D. Tsetserukou, A. Neviarouskaya, “Emotion Telepresence: emotion augmentation through affective haptics and visual stimuli during online communication,” inProc.Asia-Pacific Interdisciplinary Research Conference 2011 (AP-IRC 2011), Toyohashi, Japan, Nov. 17-18, IOPscience Journal of Physics: Conference Series 352, 2012, pp. 1-5. D. Tsetserukou, J. Sugiyama and J. Miura, “Belt tactile interface for communication with mobile robot allowing intelligent obstacle detection,” inProc.IEEE World Haptics Conference (WHC 2011), Istanbul, Turkey, June 21-24, 2011, pp. 113-118 (acceptance rate 54%). D. Tsetserukou “FlexTorque, FlexTensor, and HapticEye: Exoskeleton haptic interfaces for augmented interaction,” inProc. the Second ACM International Conference Augmented Human (AH 2011), Tokyo, Japan, March 12-14, 2011, Article number 33. D. Tsetserukou, A. Neviarouskaya, H. Prendinger, M. Ishizuka, and S. Tachi, “iFeel_IM: innovative real-time communication system with rich emotional and haptic channels,” inProc. 28th ACM Conference on Human Factors in Computing Systems (CHI 2010), Atlanta, GA, April 10-15, pp. 3031-3036 (acceptance rate 33 %). D. Tsetserukou, A. Neviarouskaya, “World’s first wearable humanoid robot that augments our emotions,” in Proc. the First ACM International Conference Augmented Human (AH 2010), Megeve, France, April 2-3, pp. 47-53. D. Tsetserukou, K. Sato, A. Neviarouskaya, N. Kawakami, and S. Tachi, “FlexTorque: Innovative haptic interface for realistic physical interaction in Virtual Reality,” in Proc. Int. Conf. on Computer Graphics and Interactive Technologies(ACM SIGGRAPH Asia 2009), Emerging Technologies, Article No. 10, Yokohama, Japan, December 16-19, 2009 (acceptance rate 29 %). D. Tsetserukou, A. Neviarouskaya, H. Prendinger, N. Kawakami, M. Ishizuka, and S. Tachi, “iFeel_IM! : Affective haptic garment for emotion enhancement during online communication,” inProc. Int. Conf.ASIAGRAPH 2009, Tokyo, Japan, October 22-25, pp. 120-123. D. Tsetserukou, A. Neviarouskaya, H. Prendinger, N. Kawakami, and S. Tachi, “Affective haptics in emotional communication,” inProc. Int. Conf. on Affective Computing and Intelligent Interaction (ACII 2009), Amsterdam, the Netherlands, September 10-12, 2009, pp. 181-186 (acceptance rate 63 %). A. Neviarouskaya, D. Tsetserukou, H. Prendinger, N. Kawakami, S. Tachi, and M. Ishizuka, “Emerging system for affectively charged interpersonal communication,” in Proc. ICROS-SICE Int. Joint Conf.2009 (ICCAS-SICE 2009), Fukuoka, Japan, August 18-21, 2009, pp. 3376-3381. D. Tsetserukou, K. Sato, N. Kawakami, and S. Tachi, “Teleoperation system with haptic feedback for physical interaction with remote environment,” inProc. ICROS-SICE Int. Joint Conf. 2009 (ICCAS-SICE 2009), Fukuoka, Japan, August 18-21, 2009, pp. 3353-3358. D. Tsetserukou, A. Neviarouskaya, H. Prendinger, N. Kawakami, M. Ishizuka, and S. Tachi, “iFeel_IM: Emotion enhancing garment for communication in affect sensitive Instant Messenger,” inProc. 13th Int. Conf. on Human-Computer Interaction (HCII 2009), Human Interface, Part 1, San Diego, CA, USA, 19-24 July, 2009, pp. 628-637. D. Tsetserukou and S. Tachi, “Efficient object exploration and object presentation in telerobotic system TeleTA with tactile feedback,” in Proc. the Third Joint EuroHaptics Conference and Symposium on Haptic Interfaces for Virtual Environment and Teleoperator Systems (WorldHaptics 2009), Salt Lake City, US, March 18-20, 2009,pp. 97-102 (acceptance rate 55%). D. Tsetserukou and S. Tachi, “TeleTA: Teleoperation system with tactile feedback aimed at presentation of the physical contact on entire robot arm surface to the human operator,” in Proc. Int. Conf. on Artificial Reality and Telexistence (ICAT 2008), Yokohama, Japan, December 1-3, 2008, pp. 64-71. D. Tsetserukou, N. Kawakami, and S. Tachi, “Obstacle avoidance control of humanoid robot arm through tactile interaction,” in Proc. IEEE-RAS Int. Conf. on Humanoids Robots (Humanoids 2008), Daejeon, Korea, December 1-3, 2008, pp. 379-384. D. Tsetserukou, N. Kawakami, and S. Tachi, “Vibration damping control of robot arm intended for service application in human environment”, in Proc. IEEE-RAS Int. Conf. on Humanoids Robots (Humanoids 2008), Daejeon, Korea, December 1-3, 2008, pp. 441-446. D. Tsetserukou, N. Kawakami, and S. Tachi, “The control algorithm enabling natural physical interaction with humanoid robot arm having joint flexibility,” inProc. Int. Conf. on Instrumentation, Control and Information Technology (SICE 2008), Tokyo, Japan, August 20-22, 2008, pp. 2777-2782. D. Tsetserukou, N. Kawakami, and S. Tachi, “An approach to contact force vector determination and its implementation to provide intelligent tactile interaction with environment,” inProc. EuroHaptics 2008 Int. Conference (EuroHaptics 2008), Madrid, Spain, June 10-13, 2008, pp. 151-156. D. Tsetserukou, R. Tadakuma, H. Kajimoto, N. Kawakami, and S. Tachi, “Towards safe human-robot interaction: joint impedance control of a new teleoperated robot arm,” inProc. 2007 IEEE Int. Symposium on Robot and Human Interactive Communication (RO-MAN 2007), Jeju island, Korea, August 26-29, 2007, pp. 860-865. D. Tsetserukou, H. Kajimoto, N. Kawakami, and S. Tachi, “Safe reaction of a robot arm with torque sensing ability on the external disturbance and impact: implementation of a new variable impedance control,”inProc. 16th Int. Symposium on Measurement and Control in Robotics (ISMCR 2007), Warsaw, Poland, June 21-23, 2007, pp. 125-137. D. Tsetserukou, R. Tadakuma, H. Kajimoto, N. Kawakami, and S. Tachi, “Intelligent variable joint impedance control and development of a new whole-sensitive anthropomorphic robot arm,” inProc. 2007 IEEE Int. Symposium on Computational Intelligence in Robotics and Automation(CIRA 2007), Jacksonville, Florida, US, June 20-23, 2007, pp. 338-343. D. Tsetserukou, R. Tadakuma, H. Kajimoto, N. Kawakami, and S. Tachi, “Development of a whole-sensitive teleoperated robot arm using torque sensing technique,” inProc. the Second Joint EuroHaptics Conference and Symposium on Haptic Interfaces for Virtual Environment and Teleoperator Systems (WorldHaptics 2007), Tsukuba, Japan, March 22-24, 2007, pp. 476-481. D. Tsetserukou, R. Tadakuma, H. Kajimoto, and S. Tachi, “Development of distributed optical torque sensors for realization of local impedance control of the robot arm,” inProc.36th Int. Symposium on Robotics (ISR 2005), TU415, Tokyo, Japan, Nov. 29-Dec. 1, 2005. D. Tsetserukou, “Method for backlash and load distribution among pins determination of trochoid transmission with account machining tolerances,” inProc. of the 11th World Congress in Mechanism and Machine Science, Tianjin, China, April 1–4, 2004, Vol. 2, pp. 843-847. O. Berestnev, Y. L. Soliterman, A. M. Goman, D. Tsetserukou. “The basis principles of reliability design for technical system,” inProc. of the 11th World Congress in Mechanism and Machine Science, Tianjin, China, April 1–4, 2004, Vol. 4. pp. 1782-1786 (acceptance rate 34%). D. Tsetserukou, “Synthesis of spherical motion platform based on four-bar linkage,” in Proc. of the 1st conference of young scientists of the National Academy of Sciences of Belarus, October 28-30, 2003, Minsk, Vol. 3, pp. 54-59,in Rus. (Best paper award). D. Tsetserukou, “Epitrochoid transmissions for robotics,” in Proc. ofthe12th Int. Symposium on Measurement and Control in Robotics(ISMCR 2002),Bourge, France, June 20-21, 2002, pp. 50-54. D. Tsetserukou, S. Hosokawa, and K. Terashima “LinkTouch: a Wearable Haptic Device with Five-Bar Linkage Mechanism for Presentation of Two-DOF Force Feedback at the Fingerpad,” Haptics Symposium 2014, Houston, TX, US, February 23-26, 2014, p. 8. S. Hosokawa, Y. Nakagawa, H. Sugiura, D. Tsetserukou, “Wearable Haptic Technologies for VR, Rehabilitation and Telecommunications” inProc.Int. Conf. of Global Network for Innovative Technology (IGNITE 2013), Penang, Malaysia, December 5, 2013, D-7, p. 90. テイエテイエルコブ　ズミトリー、杉山　淳一、三浦　純 「NAVIgoid:移動ロボット操作のためのテレイグジスタンスシステム」青少年のための科学の祭典2012・豊橋大会, こども未来館ココニコ, 豊橋, 日本,2013年01月12日-14日. テイエテイエルコブ　ズミトリー、中川雄貴、寺嶋一彦「ウェアラブルデバイスを使ったゲーム体験＆リハビリ動作体験」青少年のための科学の祭典2012・豊橋大会, こども未来館ココニコ, 豊橋, 日本,2013年01月12日-14日. D. Tsetserukou, A. Neviarouskaya, “Foottager: touch panel mediated footprint massager,” inProc.Haptics Symposium 2012, D10, Vancouver, Canada, March 4-7, 2012, p. 19. D. Tsetserukou, “Haptinoid: bilateral tactile interaction with avatar through haptic gestures,” inProc.Haptics Symposium 2012, D09, Vancouver, Canada, March 4-7, 2012, p. 8. D. Tsetserukou, J. Sugiyama, and J. Miura, “Telexistence Robotic System with High Level of Presence in the Remote Environment,” in Proc.16th Annual Conference of the Virtual Reality Society of Japan (VRSJ 2011), Hakodate, Japan, September 20-22, 2011. D. Tsetserukou, J. Sugiyama and J. Miura, “Belt tactile interface for communication with mobile robot,” inProc. IEEE World Haptics Conference (WHC 2011), Istanbul, Turkey, June 21-24, 2011, p. 30. D. Tsetserukou, K. Sato, and S. Tachi, “FlexTorque: exoskeleton interface for haptic interaction with the digital world,” inProc. EuroHaptics 2010 Int. Conference (EuroHaptics 2010), Amsterdam, the Netherlands, July 8-10, 2010. D. Tsetserukou, A. Neviarouskaya, “Innovative real-time communication system with rich emotional and haptic channels,” inProc. EuroHaptics 2010 Int. Conference (EuroHaptics 2010), Amsterdam, the Netherlands, July 8-10, 2010. D. Tsetserukou, K.Sato, A. Neviarouskaya, N. Kawakami, and S. Tachi, “FlexTorque: Innovative haptic interface for realistic physical interaction in Virtual Reality,” inProc.Int. Conf. on Computer Graphics and Interactive Technologies(ACM SIGGRAPH Asia 2009), Emerging Technologies, Yokohama, Japan, December 16-19, 2009, pp. 69 (acceptance rate 29 %). D. Tsetserukou, A. Neviarouskaya, H. Prendinger, N. Kawakami, M. Ishizuka, and S. Tachi, “iFeel_IM! : Affective haptic garment for emotion enhancement during online communication,” inProc. Int. Conf.ASIAGRAPH 2009, Tokyo, Japan, October 22-25, pp. 145. D. Tsetserukou, A. Neviarouskaya, “Affective haptic garment enhancing communication in Second Life,” inProc. Int. Conf. on Affective Computing and Intelligent Interaction (ACII 2009), Amsterdam, the Netherlands, September 10-12, 2009, pp. 586-587. D. Tsetserukou, A. Neviarouskaya, “Enhancing mediated interpersonal communication through affective haptics,” inProc. 3rd Int. Conf. on Intelligent Technologies for Interactive Entertainment (INTETAIN 2009), Amsterdam, the Netherlands, June 22-24, 2009, pp. 25. Patent RU 2244181 Int. Cl7 F16H 1/32. Planetary speed reducer with inner meshing. D. Tsetserukou, E. I. Mardosevich, V.L. Basinuk.Application number:2002128490, data of filling:23 October 2002, publication date: 27 April 2004. Patent BY 874, Int. Cl7 F 16H 19/04. Linear motion device. D. Tsetserukou, O. Berestnev, B.L. Basinuk.Application number:20020282, data of filling:10 October 2002,publication date:30 July 2003. Patent BY 584 U, Int. Cl7 F 16H 27/00. Linear motion deviceю D. Tsetserukou.Application number:20010115, data of filling:14 November 2001, publication date: 30 September 2002. D. Tsetserukou, “NurseSim3D: 3D VR simulator for nurse training”, Tenure-track Report Conference, March 14, 2014, p. 6. ティエティエルコブ　ズミトリー、「5節リンク機構を用いた指先への２自由度力覚提示のデバイス試作」第17回日本バーチャルリアリティ学会大会(VRSJ 2012), 横浜, 日本, 2012年9月12日-14日、131-132. D. Tsetserukou, “Development of wearable haptic device with five-bar linkage mechanism for presentation of two-d.o.f force feedback at the finger-pad,” in Proc. 17th Annual Conference of the Virtual Reality Society of Japan (VRSJ 2012), Yokohama, Japan, September 12-14, 2012, pp. 131-132. H. Sugiura, D. Tsetserukou, and K. Terashima, “Development of haptic interface based on wearable robotic hand,” in Proc. 17th Annual Conference of the Virtual Reality Society of Japan (VRSJ 2012), Yokohama, Japan, September 12-14, 2012, pp. 133-134, in Jap. D. Tsetserukou, “Touch responsive robotic head and affective headgear with fEMG for emotional communication,” in Proc. 17th Annual Conference of the Virtual Reality Society of Japan (VRSJ 2012), Yokohama, Japan, September 12-14, 2012, 487-488. 中川雄貴、ティエティエルコブ　ズミトリー、寺嶋一彦「バーチャルリアリティにおける力覚提示のためのウェアラブル型ハプティックインターフェース」, 第54 回自動制御連合講演会, 豊橋、11月19日20日、2011, 720-723, in Jap. D. Tsetserukou, J. Sugiyama, and J. Miura, “Telexistence robotic system with high level of presence in the remote environment,” in Proc.16th Annual Conference of the Virtual Reality Society of Japan (VRSJ 2011), Hakodate, Japan, September 20-22, 2011, pp. 642-645. 杉山　淳一、テイエテイエルコブ　ズミトリー、三浦　純「ベルト型インタフェースによる移動ロボット操作のためのテレプレゼンスシステム」情報処理学会、国内会議インタラクション2011、東京、2011年03月10日-12日、543-546, in Jap. D. Tsetserukou, K. Sato, N. Kawakami, and S. Tachi, “FlexTorque and FlexTensor: a novel wearable haptic displays for realistic and high fidelity physical interaction in virtual environment and teleoperator systems”, in Proc. 14th Annual Conference of the Virtual Reality Society of Japan (VRSJ 2009), Tokyo, Japan, September 9-11, 2009, pp. 1-4. D. Tsetserukou, K. Sato, N. Kawakami, and S. Tachi, “FlexTorque: a novel wearable haptic interface for telexistence,” inProc. JSME Robotics and Mechatronics Conference(ROBOMEC 2009), Fukuoka, Japan, 1A1-B01, May 24-26, 2009. D. Tsetserukou, R. Tadakuma, H. Kajimoto, and S. Tachi, “Local impedance control based on joint torque sensing using new optical torque sensors,” inProc. 2006 JSME Conf. on Robotics and Mechatronics (ROBOMEC 2006), Tokyo, Japan, 2P1-C08, May 26-28, 2006. D. Tsetserukou, R. Tadakuma, H. Kajimoto, and S. Tachi, “Design and use of distributed optical torque sensors for anthropomorphic robot arm,” inProc. 2005 JSME Conf. on Robotics and Mechatronics (ROBOMEC 2005), Kobe, Japan, 1A1-N-102, June 9-11, 2005. D. Tsetserukou and A. Neviarouskaya, “Development of high-performance motion simulator for virtual reality systems,”inProc. of the 21st Int. Congress of Theoretical and Applied Mechanics (ICTAM 2004), Warsaw, Poland, SM16S, August 15-21, 2004. D. Tsetserukou, A. Neviarouskaya, and J.G. Fontaine. “Development of three-dimensional animation of spherical motion platform used in virtual reality systems,” inProc. of the Int. Conf. on Modelling and Simulation(MS 2004), Minsk, April 27-29, 2004, pp. 189-193,in Rus. D. Tsetserukou and A.M. Knysh “Automation of the technical characteristic diagnosing of the cycloid planetary speed reducer,” in Proc. 22th Int.Conf. of the Young Scientists, Zelena Gura, Poland, May 14-15, 2001, pp. 214-217. D. Tsetserukou, “Nano, micro sensors and actuators for robotics”, 第8回豊橋技術科学大学産官学交流フォーラム2011, VBL, Toyohashi, Nov. 8, 2011, pp. 51-52. Best Demonstration Award, Bronze Prize, Int. Conf. AsiaHaptics 2018, Incheon, South Korea, Incheon, Korea, Nov. 14-16, 2018. 1.5 % of Award rate (3 awards from 200 demonstrations). Champions of Russia Eurobot robotic competition. reSET team from Skoltech, head of the team. April 20-22, 2018. Rostov-on-Don, Russia. Wold Ranking No. 5. Champions of Russia Eurobot robotic competition. reSET team from Skoltech, head of the team. April 27-30, 2017. Kaliningrad, Russia. Wold Ranking No. 5.Champions of Russia Eurobot robotic competition. reSET team from Skoltech, head of the team. April 27-30, 2017. Kaliningrad, Russia. Wold Ranking No. 5. Champions of Russia Eurobot robotic competition. reSET team from Skoltech, head of the team. 22 May, Skoltech, Moscow, 2016. The lecture course introduce you to basics knowledge of methods for robot design, simulation, and control of robotic system. Topics include robot kinematics, dynamics, control, design, simulation, motiond planning, and AI. The course slightly touches the research in wearable, space and telexistence robotics. The projects in robotics done by the lecturer, such as NurseSim, iFeel_IM!, FlexTorque, NAVIgoid, TeleTA will be presented. The lecture aims at student preparation and motivation to conduct projects in Robotics, Automation, Advanced manufacturing, and Intelligent Systems. The course focuses on dynamics of the systems, and their control. Such systems evolve with time and have inputs, disturbance, and outputs. One can find examples of dynamic systems in everyday life, for examples, automobiles, aircrafts, cranes, electrical circuits, fluid flow. You will analyze the response of these systems to input. Students will learn how to control system through feedback to ensure desirable dynamic properties (performance, stability). The practice will include work with industrial, humanoid, mobile, and telepresence robot. Basic computer science principles and skills, basic probability theory, basics of Matlab.